Excitebots: Trick Racing, Nintendo's sequel to Wii launch racer Excite Truck, makes the tenuous connection to the original Excitebike feel increasingly strained. How we arrived at transforming car-beasts doing mid-air stunts may be beyond explanation. But here we are, racing robotic cars shaped like mice, praying mantises and vampire bats against each other in locations spanning the globe, made all the more ludicrous by Excitebots' decision to put these brightly colored transformers in locations modeled after Finland and Fiji. The real world locations are the only thing left somewhat mundane in Excitebots, because everything else is Excite Truck fed through a Saturday morning cartoon, filtered with gum drops. The game's mechanics are almost exactly that of its Wii predecessor—steer by tilting the Wii Remote and always have the "2" button pressed to accelerate—but the silliness has been given a shot in the arm. Players aren't just rewarded for massive jumps and perfect landings, they're graded on their ability to collect sandwich parts, to lure in the biggest fish with a fishing rod attachment, and how accurately they throw pies at disembodied clown heads. It's A Fun, Colorful Freak Out: Yes, Excitebots is awesome, but only if you let yourself go. Let the game take you on a ridiculous, primary-colored ride that grabs hold of the beetle and robot obsessed little kid within. The skies are blue, the grass is green and the flowers a lovely pink. The screen is constantly a blur of activity, save for the few moments when you're flying a few hundred feet in the air, with little but the sound of rushing winds blowing past your 'bot. Expect to have your eyes dry from a lack of blinking and cheeks sore from grinning at the on-screen insanity. Super Sandwich: Every non-racing activity you'll do is just as fanciful and fun as the straightforward driving. You'll be tasked with collecting bread, meat and cheese while rail-sliding to collect the highly rewarding Super Sandwich. You'll be asked to kick footballs and soccer balls into their respective goals. In one mode, you'll have to build poker hands, no easy task while also trying to negotiate jumps and outrace your opponents. The motion control-heavy glowing "red bar" jumps get a little tedious, but each star-collecting activity has some degree of intense satisfaction. Replayability: Excitebots: Trick Racing is easy to blow through. You can see just about every track and win every race in a few hours. While the number of available tracks is somewhat meager, trying to get perfect "S" rankings on each is not such an easy task. The same is true for the game's "Super Excite" difficulty, which is grammatically spectacular. There are plenty of things (colors, dioramas, models, vehicles) to unlock, which add immensely to the replayability. Heavy Betting: Don't feel like spending hours upon hours collecting stars to blow on paint schemes for your turtle Excitebot? Take it online, then bet your stars in multiplayer races. Unlike real betting, there's hardly any risk involved, giving the online mode a reason to exist. There's A Giant Napping Glove: Did we mention there's a giant Mickey Mouse-like glove that sleeps by the side of the road, only waking to smash Excitebots with great anger? That's the kind of unorthodox roadside obstacle we like to see in our racing games. It's Excite Truck Too: Excitebots' mechanics are so similar to that of Excite Truck's that—if you don't agree that hitting baseballs or whacking 'bots with a hammer is a good time—the game may feel too familiar. The terrain deformation and turbo jumps are exactly the same, it's just the extra layer of enjoyable stupidity that differentiates the gameplay. Like Excite Truck, you'll feel wildly out of control at some points, but also like you're having your hand held during other portions of the race. Light On Tracks: The tracks in Excitebots feel familiar too and there aren't many of them. But you may not notice, as the blistering action doesn't afford you much opportunity (or necessity, really) to pay attention to the layout of each racing location. There's not a lot of variety here, which may make the game wear out its welcome sooner. Your ability to enjoy Excitebots: Trick Racing really comes down to whether or not you can tap into a child-like sense of adrenaline-fueled glee. It also helps if you find things like collecting sandwich ingredients with a bat-robot-car amusing or not. The core gameplay is solid, if not particularly refined, and the appeal of perfecting everything via "just one more race" cannot be denied. Ludicrous though it may be, Excitebots: Trick Racing layers on the high-speed insanity with aplomb. Every surreal act feels somehow natural and disarming. It's silly, charming and highly enjoyable. The online mode may feel somewhat pointless, given the handicap of Wii Friend Codes, but the single-player portion flirts with arcade-style racing brilliance. 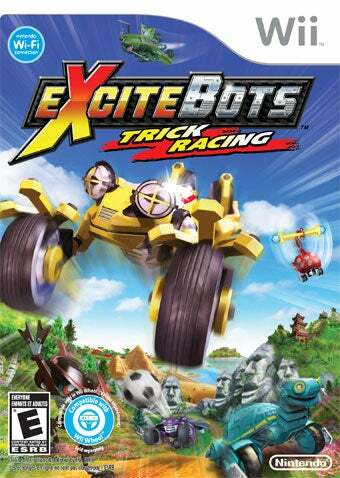 Excitebots: Trick Racing was developed by Monster Games and published by Nintendo for the Wii, released on April 20th. Retails for $39.99 USD or $49.99 USD bundled with Wii Wheel. Completed all races in Excite Mode and Poker, played multiple races online.